If you’re using an older version of Sage’s Fixed Assets (formerly known as FAS ) and you are seeking to upgrade to a current version then you may be wondering if you need to install all the interim versions — and if so where you can find those? The answer is that – yes – you will need to install the interim upgrades and that you can find those instructions and most of the versions at this Sage FAS Upgrade links page. The most current (v2012+) version information has been relocated to the Fixed Assets section of Sage’s new Customer Portal which you need an account and password to login to (only available to customers on a current Sage maintenance plan). As with all upgrades we recommend that you consult with your business partner prior to making any changes on your system. 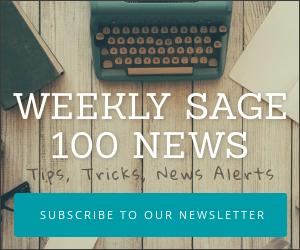 Sage MAS90 Fixed Assets becomes Sage Fixed Assets FAS 100. Say that 10 times fast. The Fixed Assets we have implemented have been mostly trouble free. In the past one big question was why customers had to pay extra to get a single user NETWORK version of Fixed Assets. The underlying technology was apparently such that Sage actually had to ship a different database or code structure. Sage also charged extra (now included) for Crystal Reporting. Now some (all) of that appears to be getting ironed out. A new update to Sage FAS Fixed Asset Solution is available for download from the Sage Software site. * The Emergency Economic Stabilization Act of 2008, which offers adjustments to Section 179 limits, is now accounted for. * The Heartland, Habitat, Harvest and Horticulture Act of 2008 (2008 Farm Act), which allows a 168k bonus and Section 179 expensing, is now included. * Updated Tax Limits. The 2009.1 tax update complies with the scheduled updates to the Section 179 limits and luxury auto limits. This includes a reduction in the Section 179 limit from $250,000 to $133,000. * Updated ITC Credits. The Emergency Economic Stabilization Act of 2008 created new ITC credits and extended the dates or increased the percentage for existing credits. Included are new credits for historic properties, advanced coal projects, and green energy expenditures. * Updated forms are now available, such as the 4562 and worksheets for your 3468, 4255, 4626 and 4797. * Assets Snapshot. Get an at-a-glance graphical summary of important information for instant command over your fixed asset “portfolio”. * Report Writer with Crystal Reports® XI . While still offering the ability to customize built-in standard reports, now you can more easily integrate Sage FAS data with data from other sources, specify run-time input parameters, create charts and graphs, and so much more. * New IRS Form 4562-FY, which reflects recently instated depreciation and amortization allowances. Need more details? Be sure to view the What’s New document for complete information! This update will be automatically mailed to you on CD over the next few weeks. Or, you can download it now and get more information by visiting: www.sagefas.com/update. Sage Software just posted this pre-recorded web seminar that reviews the features and benefits of the Sage Extended Enterprise Suite. For one fixed price per user ($2,250/user for MAS90 and $2,500/user for MAS200) you gain access to most of the accounting modules, SageCRM and FAS Fixed Assets. Happily this pricing is for concurrent users – so you only purchase the number of licenses that are expected to be active at any one time. The recorded webcast requires NO registration and lasts for about 10:30.